Smoky Mountains Lodging Guide: CELEBRATE THE HOLIDAYS IN THE SMOKIES WITH WINTERFEST! CELEBRATE THE HOLIDAYS IN THE SMOKIES WITH WINTERFEST! 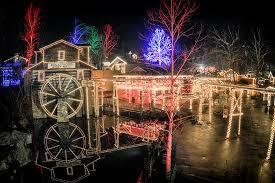 Every November the Great Smoky Mountains is lit-up with spectacular displays to celebrate the fun of the holidays in the multi-month event called Winterfest. This event features millions of brightly colored lights and lighted displays and family events throughout the cities of Gatlinburg, Pigeon Forge and Sevierville. The lighted displays begin at Exit 407 and if you follow these displays down Highway 66 into Sevierville, along the Parkway through Pigeon Forge and into the city of Gatlinburg, you will experience 15 million brightly colored lights on businesses, light poles and lighted displays created and exhibited for your pleasure. 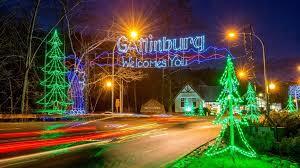 At the Sevierville Welcome Center you can buy a pair of 3D glasses to enhance the look of the holiday lights. 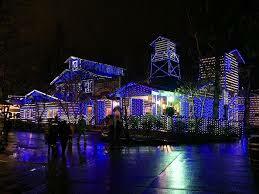 Also at Exit 407 is the Shadrack's Christmas Wonderland at Smokies Stadium, a 1.5 mile drive through an LED experience. Gatlinburg kicks off the Winterfest season with their 41st Fantasy of Lights Parade, and the next day you can watch the 54th annual Sevierville Christmas Parade. The Gatlinburg and Pigeon Forge Trolleys offer Winterfest Trolley light tours, and maps are available if you prefer to drive yourself. Other events include the Festival of Trees, Arts & Craft Shows, Smoky Mountain Tunes and Tales a New Year's Eve Ball drop, all in Gatlinburg. The Smoky Mountain area is not only lit-up with beautiful lights and displays for the holiday and winter season, but the area is alive with the spirit of Christmas. Most of the theaters offer Christmas shows, Dollywood is lit-up with Christmas lights and shows, the Titanic offers fireworks on Thanksgiving and seasonal food and specials abound in the area restaurants and shops. Come to the mountains and enjoy the holiday spirit with your friends and family. For more information on Smoky Mountain events, attractions, shows, dining, shopping and fun, go to http://bestreadguidesmokymountains.com/, and be sure and copy or download the coupons for extra savings!